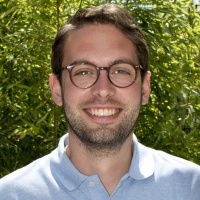 Dr. Stefano Buoso is currently a post doctoral researcher in the Interface Group at the Institute of Physiology of the University of Zurich. His main research interests are computational modeling of flows and their interaction with largely compliant structures. His current research focus is on computational hemodynamics in coronary arteries. Stefano holds BSc and MSc degrees in Aerospace Engineering from the Università degli Studi di Padova (Padova, Italy), and a MSc degree in Thermal Power from Cranfield University (Cranfield, UK) with a thesis on the fluid-structure interaction of tidal-turbine composite blades with turbulent marine flow. He obtained his PhD from Imperial College London (London, UK) under the supervision of Dr. Rafael Palacios at the Load Control and Aeroelasticity Group of the Department of Aeronautics. His dissertation focused on the development of computational models for the simulation and active control of Micro Air Vehicle wings inspired by the membranes of bats. The concept uses artificial muscles (also known as dielectric elastomers) for the control of the wing. Using high-fidelity models and model-reduction techniques, Stefano showed the potential for real-time aeroelastic control of this bat-inspired membrane wing. PhD in Aeronautical Engineering, Imperial College London, London, UK, 2016. MSc Thermal Power, Cranfield University, Cranfield, UK, 2012. MSc Aerospace Engineering, Universita degli Studi di Padova, Padova, Italy, 2012. Buoso, S., Dickinson, B. T. and Palacios, R., (2018) “Bat-inspired integrally actuated membrane wings with leading-edge sensing“, Bioinspiration & Biomimetics 13 (1), 016013. Buoso, S. and Palacios, R., (2017) “On-demand aerodynamics in integrally actuated membranes with feedback control“, AIAA Journal 55 (2), 377-388. Buoso, S. and Palacios, R., (2016) “Viscoelastic effects in the aeromechanics of actuated elastomeric membrane wings“, Journal of Fluids and Structures 63, 40-56. Open access link. Buoso, S. and Palacios, R., (2015) “Electro-aeromechanical modelling of actuated membrane wings“, Journal of Fluids and Structures 58, 188-202. Open access link. Buoso, S. and Palacios, R., “High-fidelity simulation and reduced-order modeling of integrally-actuated membrane wings with feedback control”, SPIE 9799-82, Active and Passive Smart Structures and Integrated Systems X at the Smart Structures and Materials/NDE, Las Vegas, Nevada, 20-24 March 2016.